I think we would all agree that this is not a happy horse. 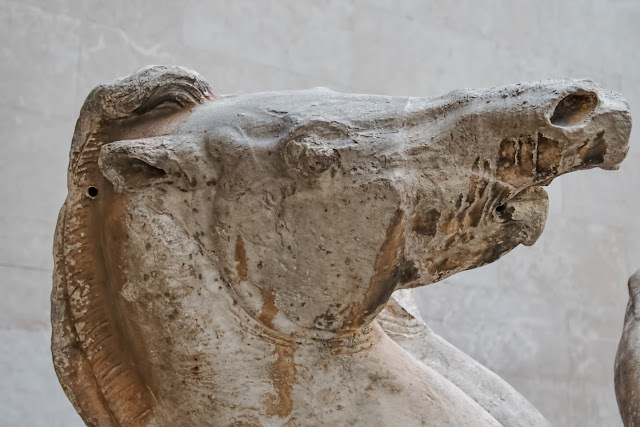 It's always a surprise to me how the humans (and/or gods) in Greek statuary always look so placid and posed, while the horses are full of passion and movement. I do know how this horse feels. I'm writing this from my office, where I am babysitting a document conversion process that I expect to be working on until I die, or retire, whichever comes first. (I have 16,000 documents to convert in this phase of the project -- so far today I have converted 323.) I brought in my personal laptop, figuring I could at least sort through photos while the conversions chugged along, but it hasn't worked out as planned. First, I forgot the charger, so I'm almost out of battery power. Second, these conversions do not chug along. Word crashes every ten documents or so and has to be restarted, and the entire process comes to a halt every so often and requires extreme coaxing to resume. So like this horse, I am neither posed nor placid. I am, unlike the software, just chugging along.